Had fun with this item. My granddaughter and I used some on a miniature tree. Loved it. I used this product as decorations for their xmas sweaters. I enjoy wearing the flashing Christmas necklace, I always get positive comments from friends and family. Wear only during Christmas season. And you'll get compliments. I used this necklace to add sparkle to a miniature Christmas tree. I used this necklace to decorate a "red hat" hat, I wrapped three of them around the crown and had white snow like material on the brim and a small plastic train and track on the "snow". It was the hit of the party! It was a lot of fun. I bought two of these necklaces for my granddaughters. One likes the steady light setting and the other loves the blinking light setting. Got a lot of comments when I wore the necklace at Christmas. Great fun! I get compliments on it every time I wear it. This blinking necklace is a delight at all functions. Many people stop to ask where it was purchased. The small children just love to watch the blinking lights flash. This necklace is a crowd pleaser. The batteries are very easy to find and to change; not complicated like some items. Can't wait to have some fun at work at the holidays. Great product. yes but before Christmas next time. Got it too late to wear for Christmas but hopefully it will still work for next year. Don't know how the life of the product is till I try them next Christmas. I've purchased these before & just love them. I get lots of compliments. Will buy again next year. Maybe the earrings too. I can't wait to wear them @ Holiday Time. I had the same necklace & it didn't light & everyone thought it could. Can't wait to wear this one that does light up. My daughter was delighted to receive the necklace just in time for a Christmas party. On Halloween, I dressed as a Christmas tree. 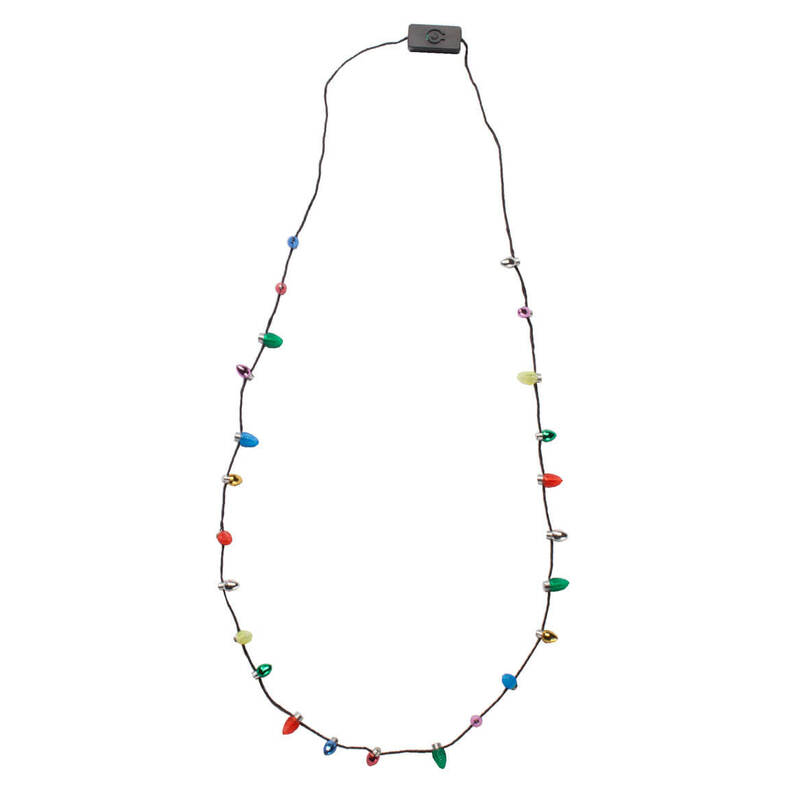 I used two of these necklaces as the lights on the tree and kept them blinking for the costume contest. They made the costume and I won first prize. They then wanted me to wear costume at Christmas time. The lights never went out. Have received positive comments about the necklace. Constantly asked where I bought it! It's goes so well with the holiday season. 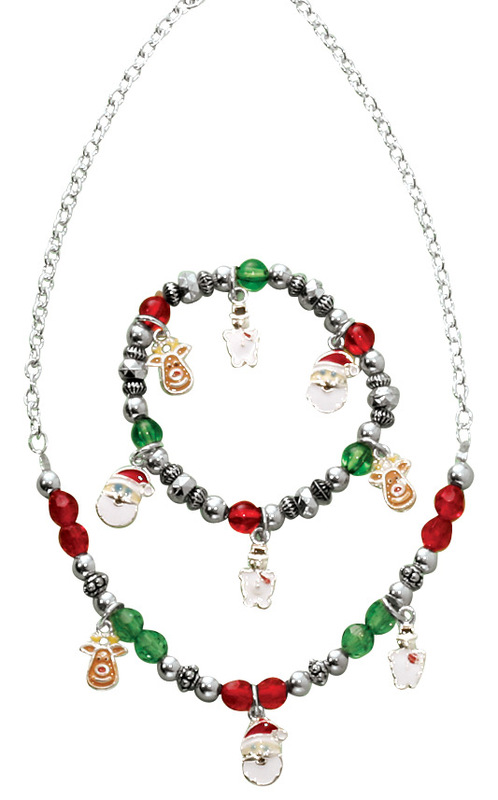 Great holiday necklace. I bought two and they both work great. Used one around base of cake I took to Xmas dinner and everyone loved it. I purchased this product again this year and gave one to a friend of mine. Fun to use for Christmas, birthdays, and any celebration. 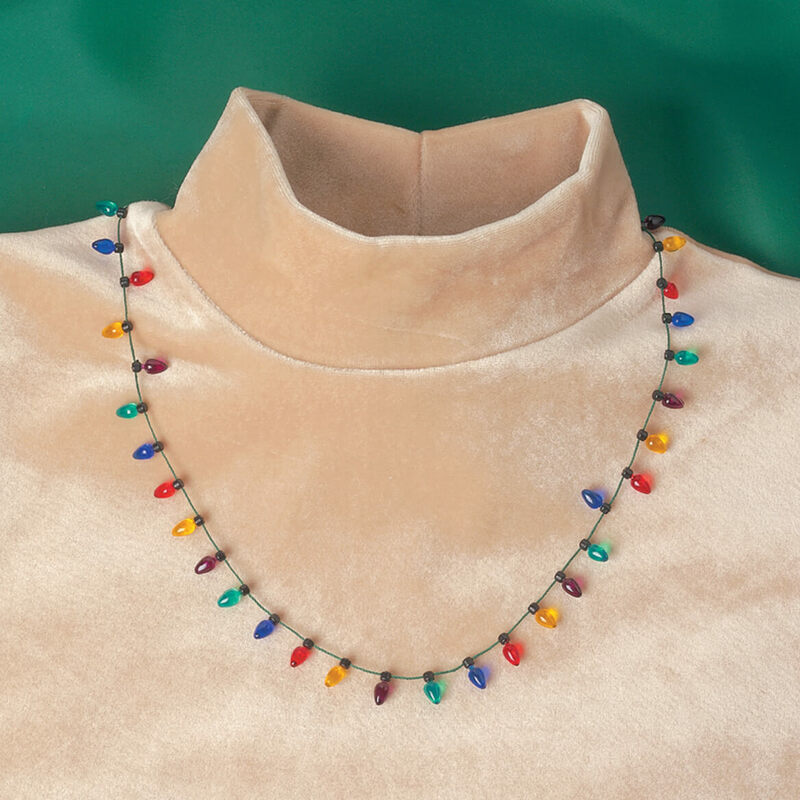 I buy these for my Mother every year to wear at Christmas time - she is in an assisted living facility and she is the hit of the place with her flashing necklace on. I buy them every year on sale after Christmas and throw them away when the batteries die - because they take two batteries at almost $5.00 each. Cheaper and easier to buy her new ones. So cute, especially at this price! Lots of compliments. Perfect for season. I wore it to a Christmas party and had many nice compliments on my festiveness. I plan to wear it to all my parties this season. It's fun and has 3 different flashing rates - none, slow, fast. I loved this and so did the children!! I work in a preschool setting and the chikdren loved this! Everyone had to try it on! It didn't even break!! Bought these as little stocking stuffers for the girls at work. We all wore them for the holiday. Really cute and love that you can turn them off. It lighted up my day. Perfect with my flashing earrings! So fun at parties & such! A fun item for the Holidays! Bought this for next year... my grandkids will love it! This is a great necklace, especially for decoration. But it has a device on it that allows different flashing options, that is not attractive for a necklace. My Grandchildren loved these necklaces.. I will look forward to having others exclaim HOW BEAUTIFUL as I wear my Christmas lights! I bought this for a lady with special needs. I think she will enjoy wearing it around the complex during the holidays. It's fun! Bought one several years ago, and it has lasted all this time. Therefore, I bought another one for me and one for my mother for the next holiday season. Great for Christmas get to gather's and other special occasions. Just a fun Item for Holiday use. The necklace is great and I recommend it for the holidays. Everybody enjoyed seeing the flashing lights. The earrings break very easily. Perhaps if the earrings were made of ceramic they would last longer. gifts 4 girlfriends back at school ! I have had a similar one for years but was tickled to see that this one lit up. alot of people ask where did I get this. Very festive to wear for the holiday! It's festive, read some of the comments. I hope it works OK.
i have one for this year and want one for next year. I gave one away this past Christmas. So much fun! I and friends need these for next years! I gave some to people last year and they liked them. I've have one and wore it out! Want a new one and my daughter wants one. Fun! I'm an adapted PE teacher working with students who have special needs. So much fun on Solstice! Keeps me in the holiday spirit! A nice conversation piece to wear for the holidays. It's a cool accessory for Christmas time. My necklace like this is old and just does not light up. Getting ready for next year celebrations, lots of lights and includes batteries. Does every light flash ? BEST ANSWER: Every third bulb is a lighted one. The two in between are just shiny. Push the button once, they blink quickly, push it again and they blink slowly. A third time and they all stay lighted, a fourth click turns the necklace off. It's a fun holiday addition to your outfit. There are 2 non-flashing bulbs in between each flashing bulb. What kind of batteries does this take, are they replaceable? BEST ANSWER: They need CR1216 which are found easily enough in stores such as Target, Walgreens, etc. You will need a very small screwdriver such as those used for eyeglass repair - again easily and cheaply found at same stores. The necklace has 3 different light settings: fast flashing, slow flashing and constantly on. I just tried mine which I got last year and haven't worn since Dec. 2013. It still works! They are so much fun to wear! I bought them for my staff and myself and we all love them. Yes you can get them at any radio shacks. Right now I am not in the area to check it for you but I know they can tell you. BTW--I have had so much fun with it. It flashes on and off, flashes in a rippling effect (one after the other) or just flashes on and off. Hope you enjoy yours as much as I enjoy mine. Merry Christmas. The necklace takes a watch battery. I have had mine a year and haven't replaced the battery yet. However, when i received it I took it to a watch repair shop and asked about the battery. I was told it would be $5 to replace. Hope this is helpful. It uses a button battery. 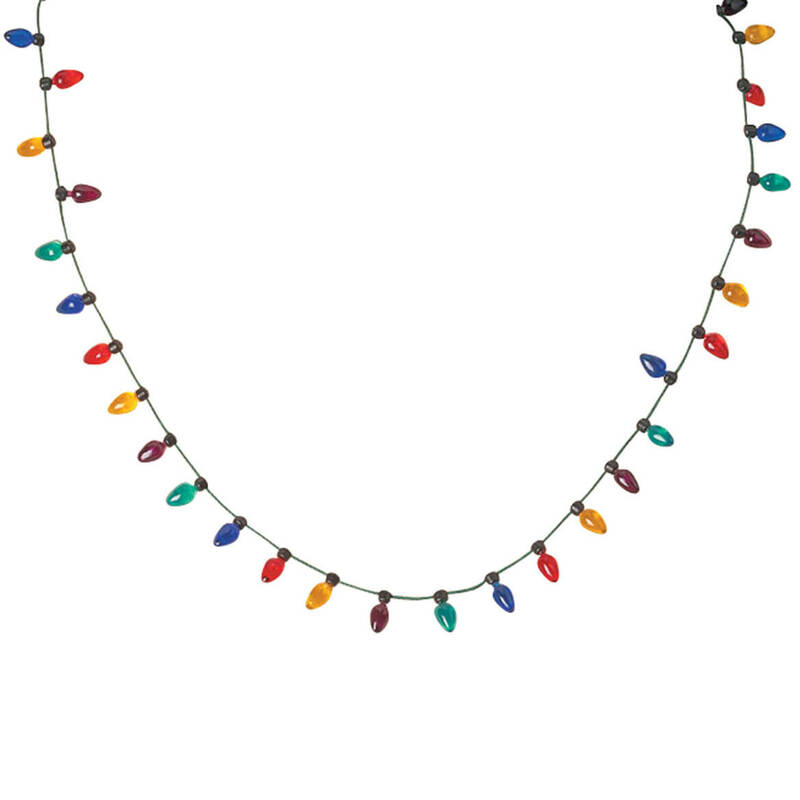 Our classic 18" L unlit Christmas necklace will add real holiday fun and flair to any outfit. Each “light” is 3/8".